"A 1958 Ferrari 250 GT Series 1 Cabriolet just sold at Barrett Jackson in Scottsdale for over $6 Million. My Pininfarina finished by Concours Interiors looks far better inside. I understand the period correctness involved in this kind of restoration, but up close the way the leather is tucked and matched, it is difficult to tell the difference between an original and the work I had done at Concours Interiors"
Nate R. Minneapolis , MN. "I have my '54 MG TF in an upholstery shop here in Huntington Beach where they are installing the Moss Motors kits I bought. So far it all looks pretty good but, it's not what Richard Pirics at Concours Interiors would do! I know I've said this before but every time I look at the 308 my eyes go right to the interior. It's outstanding and it still gets compliments as to how nice it is. So, thanks again and I can only hope one day you'll move back to Southern California so I can have you do the interiors on my car projects. Take care of yourself and stay healthy!" We had two Ferrari Dashes a 348 & 360 that had the leather shrink up due to the sun. Concours Interiors recovered both to better than expected quality. Richard used the correct AutoLux leather and supplied photos throughout the recovering process. The work was completed in a very timely manner, we highly recommend Concours Interiors. I needed to have my Harley Davidson seat recovered and could not find any shop in the area that could do what I was looking for. Richard at Concours Interiors was recommended and after a short discussion on what I wanted we came up with a new diamond tufted design with Neon Green stitching to match the pin stripping on my gas tank. 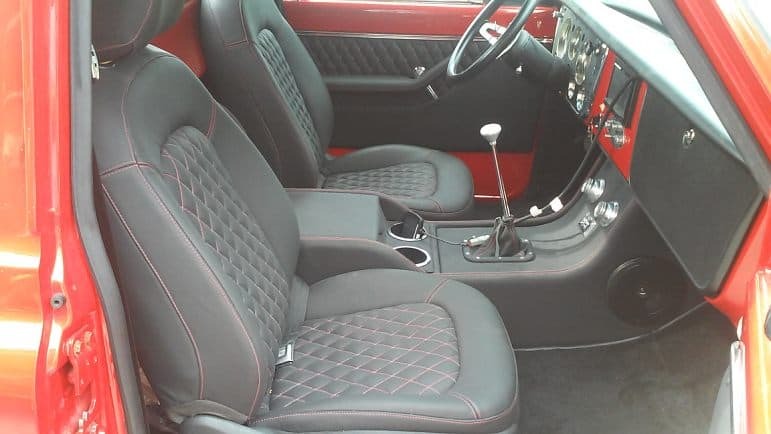 The seat was covered in Black AutoLux leather and with the Neon stitching it looks absolutely amazing, I couldn't ask for better, Thank You Concours Interiors! 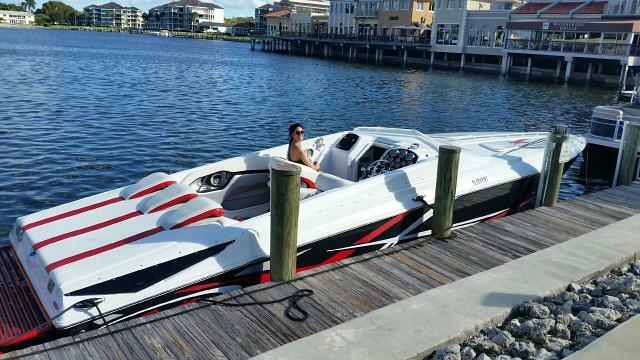 I was searching for a local upholstery shop to install my new already made custom jet ski cover. I found Concours Interiors website and on their Services page it says No Job Is Too Small�. When I contacted Richard he said no problem, bring it by. I dropped the seat off and picked it up the next day, PERFECT! He even covered the foam in plastic before installing the new cover. Great Job! I was getting my daily driver washed at the local car wash and found a stack of business for Concours Interiors. The card was eye catching by itself as it pictured the Ferrari Hybrid on the front. 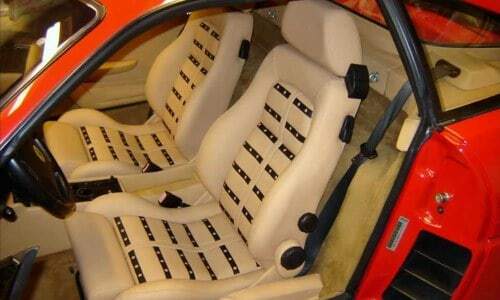 I own a Ferrari 348 and have been thinking about getting the seats recovered but was not real comfortable with any of the local shops doing this type of job. I spoke with Richard and was instantly taken with his experience, customer service and knowledge of Ferrari interiors. 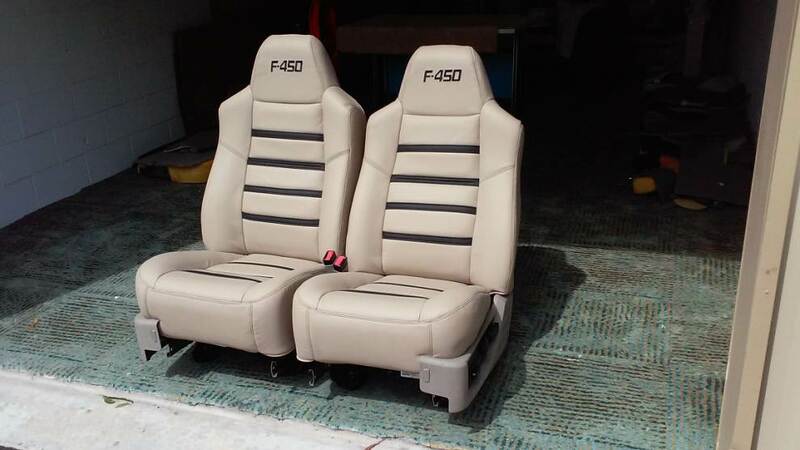 I've been looking for months to find somebody that could re-do the seats on my Custom F-450 Ford Dually. When I came across the website for Concours Interiors I knew immediately Richard was the guy for the job! Outstanding customer service, great communication, great to deal with. Everything was smooth as silk from start to finish. 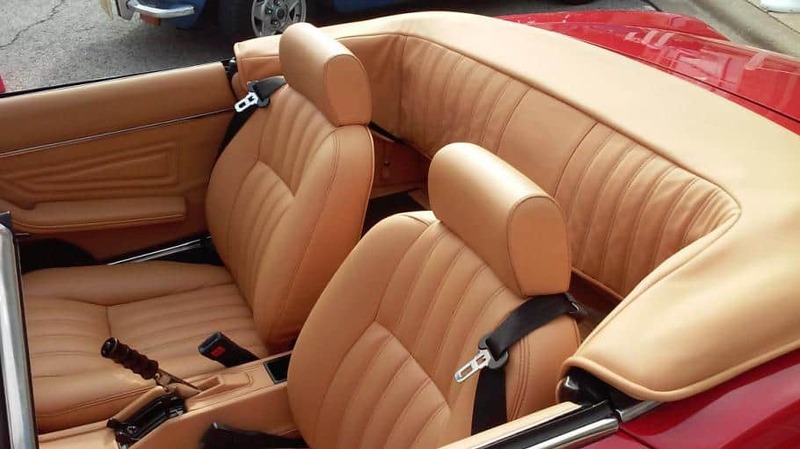 Oh, the seats were absolutely outstanding, Richard gave them a new, fresh contemporary design, used high quality Audi Beige Leather with Black accents and Black stitching. I Can Highly Recommend Concours Interiors! Thanks For A Great Job! New to Southwest Florida Concours Interiors did an amazing custom leather interior job on a Custom 1967 Chevy Pick-Up I had in my shop for some engine work. Richard completely re-designed the special Audi seats the customer wanted with diamond inserts and red stitching. He also re-styled the drab door panels with diamond inserts and incorporated a Fiat arm rest to replace the less than desirable factory arm rest. He also re-covered the center console that now looks 100 times better than it ever did before. Needless to say Concours Interiors is soon to be the go to shop for high end custom leather interiors. We're glad you're in Florida. Keep up the good work! A very special thanks to Concours Interiors for taking on a job that nobody wanted to do. Not only did Richard create a new custom look for my very large engine cover, but handled some special wood repairs as well. Very pleased with the entire job!! Great Communication & Easy To Work With!! I happened to walk by Concours Interiors and noticed a set of Ferrari seats being made. I just couldn't get over the design and quality of the seats. I was sure that they were just delivered from the factory to match the dashboard Richard was working on. 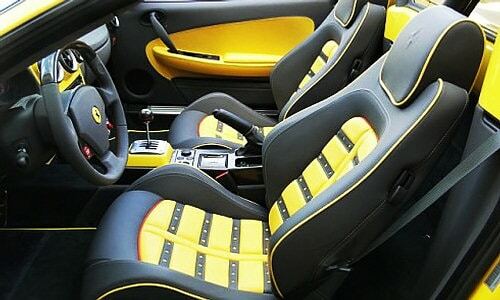 I have a Toyota Tacoma pickup and I had no intentions of having my seats done until I saw the Ferrari seats. I asked Richard if it was possible to duplicate the Ferrari seat design into my truck, he said no problem. He took the time to get the color and design I wanted and even worked up a sample for me to approve. 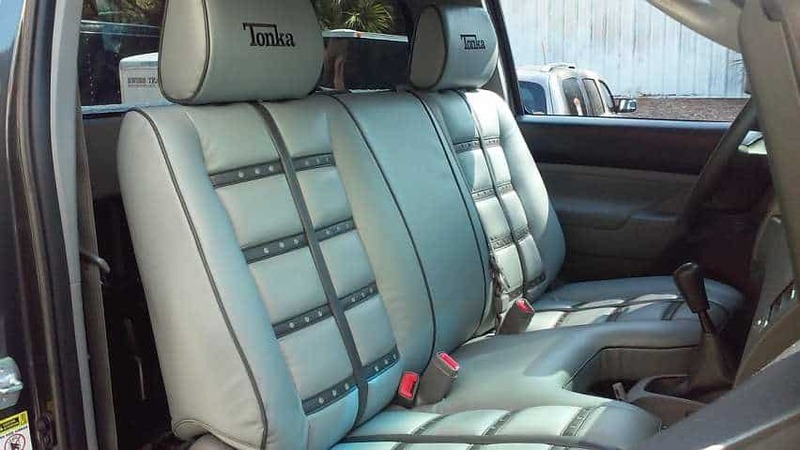 There aren't any words I can say to describe the seats in my truck. Words just don't exist to describe them. Richard is a true Master & Artisan. 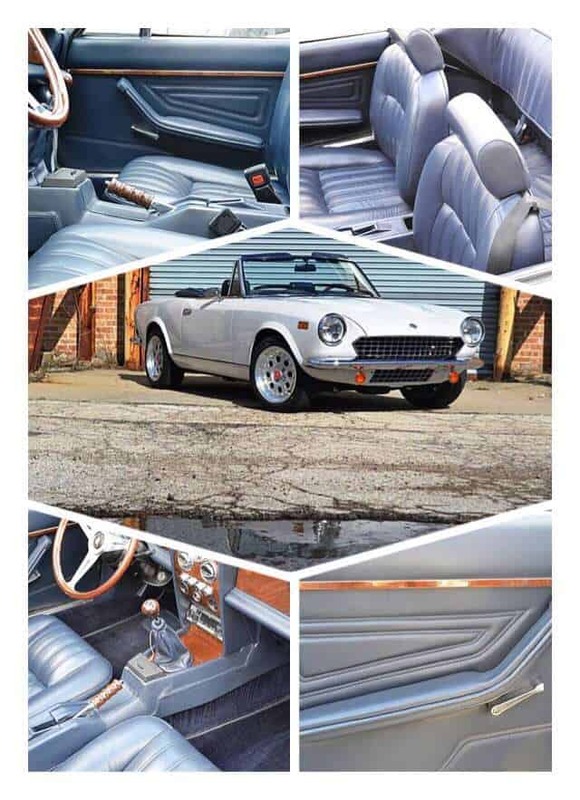 Fiat 124 Spider Upgraded Complete Leather Interior.